Treat the places where the mites hide during the day, the cage or aviary should be sprayed. Cleaning prior to treatment promotes the effect. 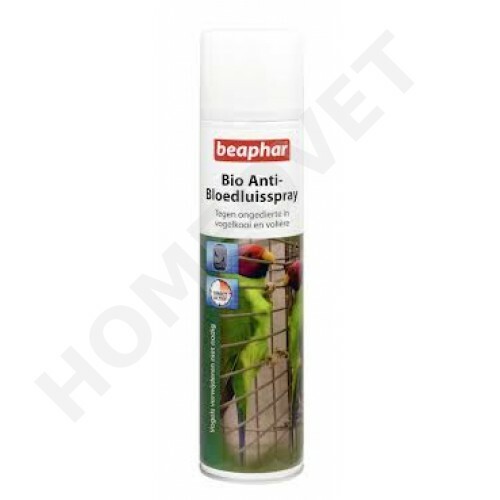 Should only be used as repellent against crawling insects. The red mite measures between 0.7 and 1.1 mm in length. It crawls across the body of the bird on its eight legs and feeds on the bird's blood. During the day, these tiny parasites hide in corners inside the cage or in crevices in perches where they reproduce.Since the red mite is active during the night, it cannot be traced on the bird during the day. A budgie suffering from these mites is extremely restless at night, does not get any sleep and scratches itself often. During the day, the bird sleeps often and appears to be exhausted and depressed. In order to trace these mites, a white piece of cloth should be draped over the cage which should be checked during the night for any suspicious small red dots walking across the cloth. Sprinkle some places of about 20 a 30 cm. Spraying surfaces of 1 m distance. After 2 weeks a look if nog 2 treatment is necessary. Beaphar Anti - aphids affects 3 months. 300 ml is sufficient for 16 m2.